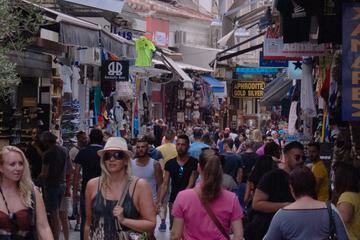 Shopping in Athens is a unique experience, as, we will admit, so it is in any major capital city in the world. If you, as a visitor with very limited time to spare, are going to be content with a quick glimpse of the picturesque local market, then we suggest that following your must-visit to the Acropolis Museum, you walk down to Vyronos Street, see the Monument of Lysicrates, continue on Adrianou Street in the historic Plaka district, the oldest commercial street in Europe still in use, all the way down to Agora Square, take a right and then an immediate left to Pandrossou Street, stroll down Monastiraki Square and the area around it. You will pass by a great number of shops, small and larger, some with excellent and other with trashy merchandise to sell. Truth is that most of these shops sell to tourists only, are used to bargaining and some have incorporated it n their pricing and expect your counter-offer, and may of them offer generic touristy trash that is only to be taken as memorabilia. ​There are, however, a good number of shops that offer quality stuff, worth exploring for, There are guided tours to take you shopping, and we have included some elsewhere in our website, but if you do have some time, go on your own, exercising the same caution and wisdom you would in your own country. There are no special dangers to tourists in Athens, and you'll find that most people are fluent in English and will gladly give you general directions to find your way around. ​​People will tell you to go shopping on Ermou Street. They are right, but this is true mostly for the locals. Ermou is packed with very successful international brands, the ones you may find in your hometown upscale shopping mall or in the downtown shopping district of any city. The same is true, with very few exceptions in the upscale Kolonaki district, with snobbish residents and expensive stores. But, you did not come to Greece to find the same old same old, or did you? There is a multitude of hidden treasures, in clothing, shoes, sandals, leather bags, and all sorts of accessories all over the historic and commercial districts of Athens, worth searching for! Small Walking Group Shopping tour in Athens while walking in Athens and listening about the city. Grab the chance and take the best souvenirs back home. In this exceptional walking tour you will have the opportunity to scrawl with the help of your local expert guide through the multifaceted markets of Athens. Souvenirs, musical instruments, paintings, vintage, casual, and luxury clothing as well, jewelry, cosmetics, local spirits and wine and more are waiting to be discovered by you, and who knows some of those will be your new partners in the travel back home.